« A Quick Brewfest Token-saving Tip! Addon Control Panel. It lets you load and unload (some) Addons from within the game, set up to 10 preset Addon configurations and is generally all kinds of awesome. I completely agree with you. A couple of weeks ago I was looking for a way to sort the character list since my main is not on the top of the list (which it seems like it should be). While it’s not really a big deal to some people, it’s really frustrating to me. It should be a very easy thing to implement. 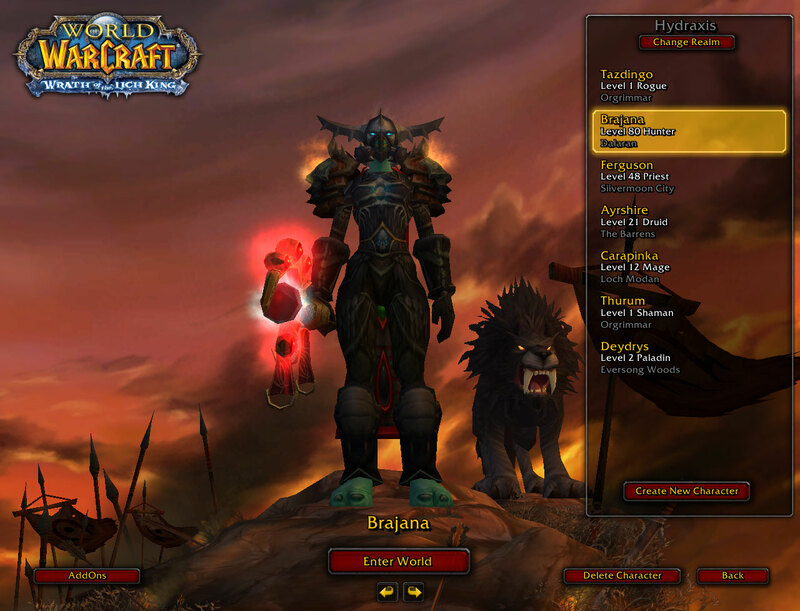 Sarama´s last blog ..saramatich: I got up this morning, excited to play WoW, and the servers are down… I forget about this every Tuesday… heart crushing..
Good ideas. For a current work around to disabling un-needed addons I use Addon Control Panel. It gives access to to disabling and enabling addons from within the game. I hate logging out to do that when maybe one or two could be giving trouble. Edit: I should refresh before I post. LOL. Kudos Brendon. You can get some of the functionality of selecting different addons already because you can set which addons you want active for a particular character. For an alt you are leveling, turn on your questing related mobs, and turn off DBM. For your main, do the opposite. Of course, that doesn’t help if sometimes you raid on your main and sometimes you quest. I really like all these ideas – they would help so much! Not only the “select addons” but the ordering. I’ve wanted to have ordering in character lists for the longest time… I’ve been known to delete banks and do an arduous transfer of items to a character, then back to a new bank so things would be “in order” when I have a new alt. Great suggestions! Especially having better addon organization. The one thing I would love to have added is to show professions for each toon. I always forget which alt has which profession before I login and have to check my own notes in order to find out. Nibuca was talking about her UI, and she uses TooManyAddons… sounds very similiar to Addon Control Panel. Set profiles, do it on the fly, etc. Personally, I haven’t used either one, so I don’t know… but great ideas. And you know… that’s where Blizzard gets most of their ideas for their UI… from current mods. Ah, nice ideas. Nothing too hard to implement so I’m giving this two thumbs up! Or perhaps, I should say 8 tentacles up! Ninjaoctopus´s last blog ..Wipes: We’ll Need A Clean Up On Aisle TOC! Thanks for the suggestions about the addons… although for me it feels a bit strange to enable another addon so I can disable other addons But anything that helps, right? 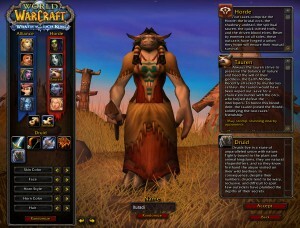 I saw the link to this over on wow.com and man, there isn’t a part of the game that I’d like to see updated more. I’ve been lamenting the inability to see which characters have unread mail in their mailbox via the character selection screen since about the second day I was playing the game. Recently I began using the addon Altoholic, which, among other things, tells me which characters have mail in their mailbox (though it isn’t always 100% accurate). 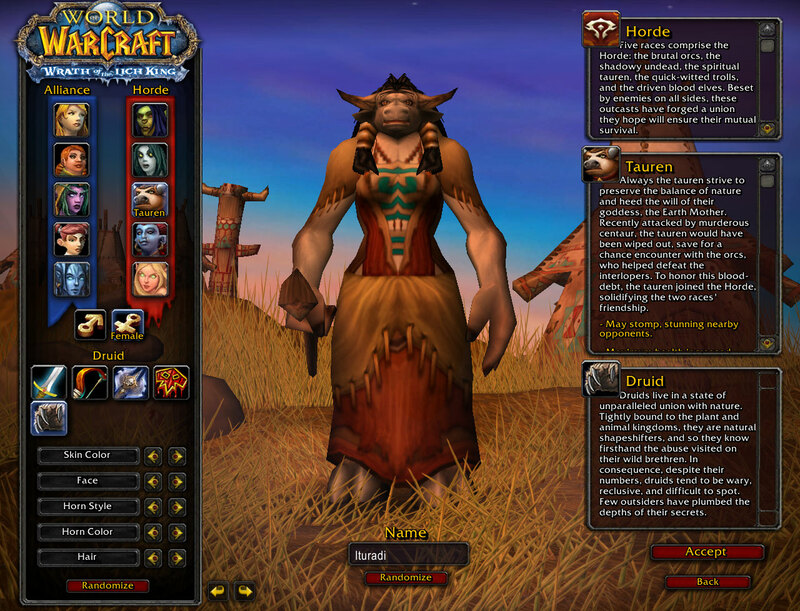 The other thing I’d love to see upgraded (and this was mentioned on wow.com but perhaps not here), is the character creation screen. The two things about that process that’ve long made me grind my teeth in despair is how far out the camera is from the character you are creating. On several occasions I’ve made a character, logged in, zoomed in as close as I can to check out the facial features I’d chosen, and then rerolled with another option. The barber shops obviously allowed for some tweaking (and even the paid services allow you a ‘do-over’ now), but it still seems silly you can’t see that stuff closer up on creation. Similarly I love the different ‘mood’ lighting for the different races, but it can really affect how certain characters look. While making a troll recently I realized that the skin color I’d chosen looked significantly different in game compared to the creation screen because of the ambient light in the Ogrimmar/Durotar setting. Same goes even moreso for the Death Knight creation screen. They even get their cool alternate skin tones but it’s hard to see what shade it is under all that blue. Thanks for letting me complain about this, it’s been bothering me for awhile now. Kevin – I did in fact mention that exact thing – zooming and changing the camera angle in the character creation screen is one of those changes I wish they’d implement! You’re also right about the lighting, I hadn’t thought about that but I have had the same issue with Draenei. Whenever I pick one, the skin tone is not what I expect. Complete waste of time… unnecessary. The best interface is the simplest one – and Blizzard knows this. It’s why their official forums are also very “stripped down” compared to what one might expect. The character screen is perfect as it is -to select your character. It’s not the add on screen, it’s not the unread mail screen, etc. There are interface elements IN the game, where they should be, for those. Lethality – You’re entitled to your opinion, of course. However, Blizzard has always had a history of finding little things to improve the everyday use of the game… more mailboxes in cities, universal auction houses, half-hour hearthstones, and colour-coded character names just to name a few. They’ve all been easy to implement and ‘unnecessary’. But in my opinion, if they add a feature that does nothing to harm you, it’s a good thing. You don’t have to use it if you don’t want to. Regarding addon previews on the addons screen – what ever they implement better be damn secure and really well protected or they shouldn’t do it at all. There’s a reason why Addons don’t load until fully logged into the game – that way keyloggers have less opportunity to log your password as the password has long since passed from memory by the time they get fully loaded. Maybe they could do it by having addon authors put a preview.jpg and a preview.txt in their addons and have some mechanism to load those that can’t be hacked to log keys.